Looking for something to do on a Friday night that is affordable and fun? Then you've come to the right place! 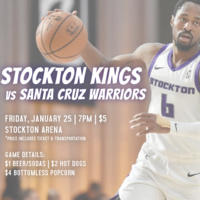 ASuop will be having an excursion to the Stockton Kings vs. Santa Cruz Warriors game. Tickets are on sale for $5, which includes transportation and admission to the game. The bus leaves from Burns Tower at 6 PM and the game is at 7 PM. Food and drinks are not provided, but they have special pricing for $1 beer/soda, $2 hot dogs, and $4 bottomless popcorn! You don't wanna miss out!